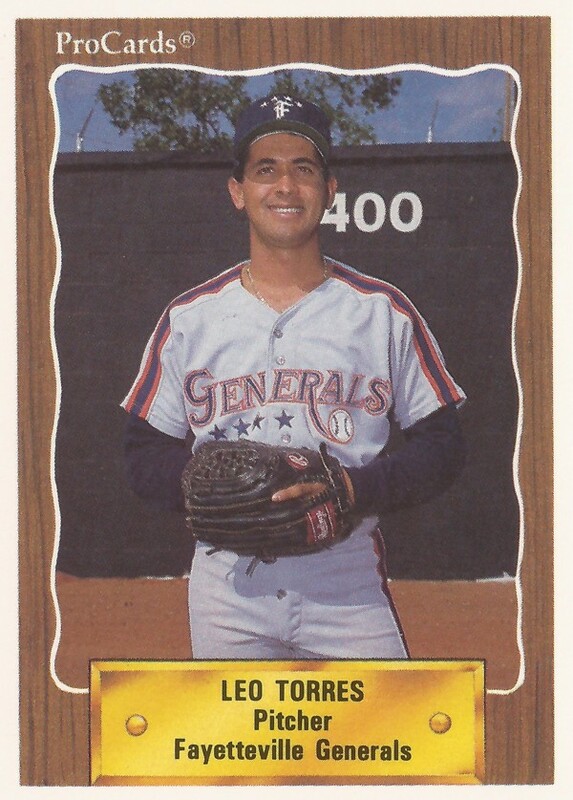 Leo Torres picked up the save in this June 1990 game for Fayetteville - a long save. Torres pitched over the final four innings of the 8-2 win over Greensboro to seal the Fayetteville victory, according to The Greensboro News & Record. Torres saved a total of three games for Fayetteville that year, his second season as a pro. He went on to play in two more seasons. He made AA, but he didn't make the majors. Torres' career began in 1989, signed by the Tigers as a free agent out of his native Dominican Republic. He's sometimes credited by his full name, Leonardo Torres. 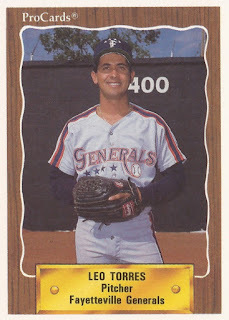 Torres started with the Tigers at single-A Fayetteville in 1989. He went 9-10 there, with a 3.94 ERA over 43 outings, 10 starts. He threw a scoreless inning in a July Fayetteville win. He gave up four earned in an inning and a third in another July outing. Torres returned to Fayetteville for 1990. He also saw time at high-A Lakeland. He went 7-1 between them, with a 2.16 ERA. He played at Lakeland all of 1991. He went 3.2 innings in a July game, giving up a single run. In 42 outings, one start that year, he had an ERA of 2.76. Torres returned for 1992, but it turned out to be a short season. He got into eight games at Lakeland and another five at AA London. He gave up six earned in five innings at London and had a 6.39 ERA overall in his 13 total outings. His 1992 season turned out to be his final season as a pro.